I read this recently, and it caused me to think about my role as a school administrator. 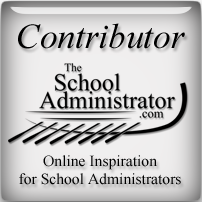 Again, as you know, I’m learning as much as I can as I journey toward school administration mastery, and the more I learn, the more it seems that my destination gets further and further away. Still, I’m enjoying the trip. Thank you for taking the time to join me. Sanctioned incompetence is a concept that I never want to be accused of. We all know people on our staff who won’t or can’t do the job they are being paid to do. This can be teachers, custodians, office staff, or teacher assistants. When I was a teacher, I would get frustrated when a fellow teacher would consistently do a poor job and not get called on it. I really didn’t know what the administration was doing about that teacher, but my perception was that the teacher was being allowed to continue to do sub-par work without consequences. It was demoralizing. It made me wonder why I was working so hard, and it made me lose some respect for my administration. I can’t let this happen to me now that I’m in the administrator’s chair. Make sure the expectations are clear. How can I expect a person to do what is required if what’s required has not been understood? Communicate with the person individually. I used to hate it when the administration would scold the entire staff about something that only one or two teachers were guilty of. A leader should not be afraid of the one-on-one meeting to discuss performance issues. Create benchmarks. What is expected to happen at what time? The expectations are clear. Now it’s time to determine how and when they are to be met. Keep my promise to follow up. This, I believe, is crucial. If I don’t follow up when I promised, then I’ve demonstrated that it’s all talk. Document the process. This doesn’t have to a formal write-up, but there has to be a written record of every conversation that has taken place. Acknowledge success or failure. Make time to reward successful completion of the goals or to remind the person of what was agreed to. A leader needs to be courageous enough to have those crucial conversations with those people who are not completely on board with the vision. If you’re looking for ways to successfully have these conversations, check out, Crucial Conversations Tools for Talking When Stakes Are High, Second Edition. What do you think? What other strategies would you suggest to deal with staff members who have performance issues?